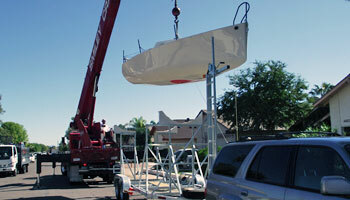 The Mini 650 sailboat emerging from the garage and being loaded on Dave’s home-built trailer. They floated the boat in 2012. You remember the saga of Dog Year, the Open 6.50 Meter (aka Mini 650) that Dave Christensen and Wendy Larsen built in their garage? Let the saga continue. Dave has now announced that he’s found another use for all those wood clamps he bought to build the boat. 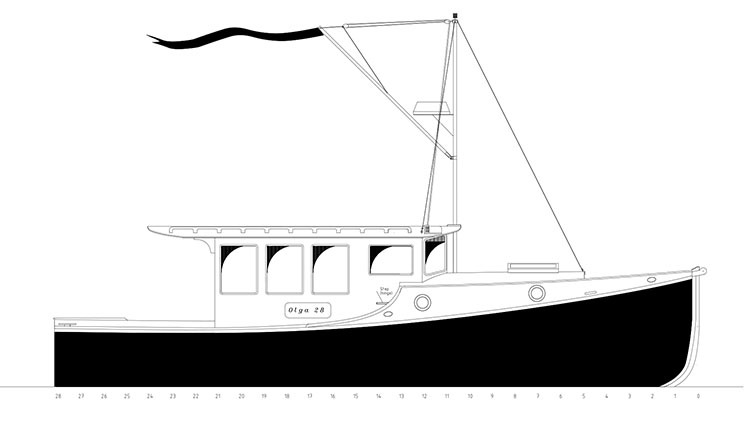 He’s building another one, this time a 28-foot trawler powered by an outboard. This too begins with nothing more than plans and a pile of plywood. Dave told the AYC monthly meeting that he and Wendy are planning the new boat to use for retirement in a few years. It’s a snug home that they figure would be good for the area around San Juan islands and maybe for an inland swing around the Eastern U.S.
Dog Year is a 20-foot boat that was built in a 19-foot garage, which meant punching a cutout into a bedroom. With a 28-foot boat under construction at the DandW Boatworks, this time they’ll take pretty much the entire bedroom. Dave and Wendy are going with power this time.